I’m giving you all of these components together because it makes a nice plate. You can pick and choose the elements as you wish. Timing notes for orchestrating the whole meal are at the end. Pat the salmon dry with paper towels and season, first with salt, then pepper, then the chili mélange (or, as noted above, with any powdered chili if you do not feel inclined to make the mélange). Be gentle with the chili component, as you do not want to overpower the rest of the flavors. Dip the salmon in the egg mixture, then roll in the almond mixture. 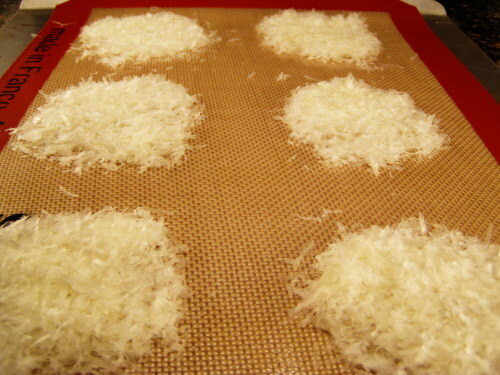 Press the almonds into any bare spots you see until each piece is well coated. You may want to rinse your hands between each piece, as the almonds and panko will build up on your fingers and make it tough to work effectively. Heat the olive oil in an oven-safe skillet over medium-high heat until the oil is shimmering. Turn the heat down to medium-low. 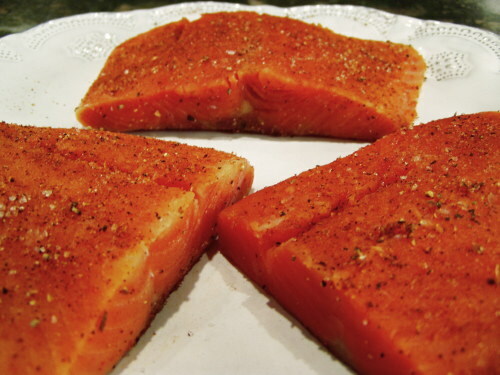 Gently lay the salmon in the pan and sauté each side for a few minutes until the coating turns golden. Transfer the whole pan to the oven and finish – you will need approximately 10 minutes per inch of thickness. 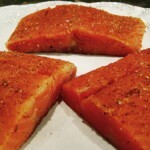 Salmon is done when it is opaque throughout and flakes easily when prodded with a fork. If you do not start with cooked rice, do the following: heat the oil over medium heat in a heavy saucepan until shimmering. Add the garlic and ginger, stirring occasionally until they are puffy and fragrant. Stir in the rice and sauté until the grains are shiny. Add the coconut milk and water. Stir and bring to a boil. Reduce to a simmer, cover, and cook until the liquid is fully absorbed. Remove from heat and allow to stand undisturbed (leave the lid on) for 15 minutes. If you start with cooked rice, the steps are essentially the same except that you will leave out the water. Sauté the garlic and ginger first, then stir in the cooked rice and coconut milk. Keep this mixture over low heat, stirring occasionally, until everything is heated and the coconut milk has nearly absorbed. No need to let it stand – serve when ready. Line a cookie sheet with parchment paper or a Silpat. I prefer the Silpat here, but the parchment will also work. 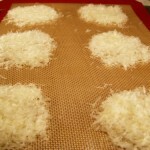 Make 6 little haystacks with the grated cheese. Pat each one down with your hand until you have circles of relatively even thickness. Place the cookie sheet in the oven and bake until the circles are golden brown – anywhere from 10 to 15 minutes (but let common sense be your guide – stay close, and take a peek every now and then). Allow to cool on the cookie sheet before trying to move them. Combine all of the ingredients in a small, lidded container and store in a cool, dry place. This will make approximately 1 cup and is absolutely wonderful to sprinkle into your cooking when you want a little heat with a complex flavor. As any home cook will tell you, one of the most difficult things to perfect in preparing a meal is timing. It takes a little practice and a good deal of thought to get all of your components done and ready to plate at the same time. If you find yourself falling short in this respect, there are two things you can do. First, cut yourself some slack. It’s not the end of the world to eat your dinner in courses. Second, be sure you are reading through every recipe fully before you begin. If you must, chart out the timing on a piece of scratch paper, working backwards from the time you want to put the food on plates. Begin by mapping out whatever will take the longest and work in the other elements, noting when things will need your hands-on attention. For this menu, some of your timing will depend on whether or not you are starting with raw rice. If so, start there, then move on to the cheese crisps. 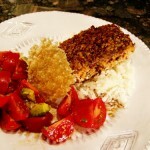 While the cheese crisps cool and the rice does its thing, move on to the salmon. This menu is a good example of a main dish that takes less time than the sides. 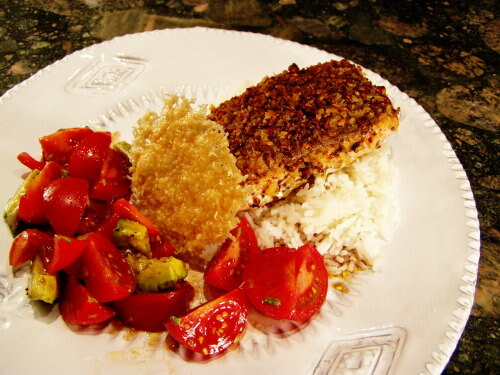 The sautéing and final cooking of the salmon will take around 15 minutes, so don’t start it until your rice has come off the heat (again, if you are starting with raw rice). If you begin with cooked rice, like I do, start the crisps first. While they cool, crank up the oven and get your salmon moving. While it finishes in the oven, get busy with the rice. And whenever you find your little hands idle because everything is cooking on its own, clean up your kitchen. You will thank yourself after dinner. The Salty Spoon is powered by	WordPress 2.7 and delivered to you in 0.238 seconds using 24 queries.